For a field that relies on fossils that have lain undisturbed for tens of thousands of years, ancient human genomics is moving at breakneck speed. Barely a year after the publication of the genomes of Neanderthals1 and of an extinct human population from Siberia2, scientists are racing to apply the work to answer questions about human evolution and history that would have been unfathomable just a few years ago. The past months have seen a swathe of discoveries, from details about when Neanderthals and humans interbred, to the important disease-fighting genes that humans now have as a result of those trysts. Neanderthals were large-bodied hunter-gatherers, named after the German valley where their bones were first discovered, who roamed Europe and parts of Asia from 400,000 years ago until about 30,000 years ago. 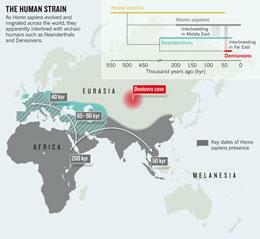 The Neanderthal genome — shepherded by Svante Pääbo at the Max Planck Institute for Evolutionary Anthropology in Leipzig, Germany — indicates that their evolutionary story began to split from the lineage of modern humans less than half a million years ago, when their common ancestor lived in Africa (see 'The human strain'). In December last year, Pääbo's team released the genetic blueprint of another population of ancient humans — unlike ourselves or the Neanderthals — that was based on DNA recovered from a 30,000–50,000-year-old finger bone found in a cave in Denisova in southern Siberia2. Palaeoanthropologists call these groups archaic humans, distinguishing them from modern Homo sapiens, which emerged in Africa only around 200,000 years ago. Pääbo is amazed at how quickly the Neanderthal genome has been mined. At a genomics meeting last year, for example, Cory McLean, a graduate student at Stanford University in California, was scheduled to talk immediately after Pääbo presented the Neanderthal genome. Inspired, McLean had trawled through the just-released genome in the days before his talk. He discovered that Neanderthals, like humans, lacked a stretch of DNA that orchestrates the growth of spines on the penises of other primates, and promptly presented the find just after Pääbo presented his3. Since then, scientists have fleshed out the details of one of the biggest surprises from the Neanderthal genome: humans living outside Africa owe up to 4% of their DNA to Neanderthals. One explanation might be that humans migrating out of Africa mated with Neanderthals, probably resident in the Middle East, before their offspring fanned out across Europe and Asia. By comparing individual DNA letters in multiple modern human genomes with those in the Neanderthal genome, the date of that interbreeding has now been pinned down to 65,000–90,000 years ago. Montgomery Slatkin and Anna-Sapfo Malaspinas, theoretical geneticists from the University of California, Berkeley, presented the finding at the Society for Molecular Biology and Evolution meeting in Kyoto, Japan, held on 26–30 July. Slatkin says that their result agrees with another study presented at the meeting that came from the group of David Reich, a geneticist at Harvard Medical School in Boston, Massachusetts, who was involved in sequencing both the Neanderthal and Denisova genomes. The dates also mesh with archaeological finds bookending early human migrations out of Africa to between about 50,000 and 100,000 years ago. Reich's team is now developing tools to find signs of more recent interbreeding that might have occurred after humans arrived in Asia and Europe. The denizens of Denisova also bred with contemporary humans, according to Pääbo and Reich's analysis2. But the only traces of their DNA to be found in modern humans were in residents of Melanesia, thousands of miles away from Denisova, suggesting that the Denisovans had once lived across Asia. In 2008, Pääbo's team set up a lab in Beijing to screen fossils that might contain Denisovan DNA, in the hope of learning more about them and their interactions with modern humans. Currently, the bone that yielded the Denisovan genome, and a single molar from the same cave, are their only known fossil remains, but other archaic human fossils from Asia could bear traces of this group. 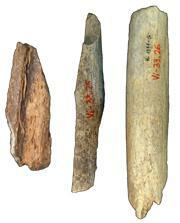 Most of the Neanderthal genome was sequenced from bones found in Vindija cave, Croatia.Max Planck Inst. Evol. Anthropol. Even before the Neanderthal genome made its debut in May 2010, scientists had argued that humans may have acquired not just DNA from archaic humans, but useful traits too. Human gene variants linked to brain development and speech were proposed as candidates, only to be scotched after closer inspection of the Neanderthal genome. However, a study presented at a Royal Society symposium in London in June suggests that humans owe important disease-fighting genes to Neanderthals and Denisovans. Interbreeding endowed humans with a 'hybrid vigour' that helped them colonize the world, said Peter Parham, an immunogeneticist at Stanford University School of Medicine, California, at the symposium. Parham's team compared a group of diverse immune genes — the human leukocyte antigen (HLA) genes — in Neanderthals, Denisovans and human groups from around the world. In several cases, Neanderthals and Denisovans carried versions of HLA genes that are abundant in modern humans in parts of Europe and Asia, but less common in Africans. Varying degrees of interbreeding could explain the mismatch, Parham says. He estimates that Europeans owe 50% of variants of one class of HLA gene to interbreeding, Asians 70–80%, and Papua New Guineans up to 95%. "It does mean that some of us owe part of our immune-system function to Neanderthals," says Pääbo. However, John Hawks, a biological anthropologist at the University of Wisconsin-Madison, notes that many HLA genes pre-date humans' split from Neanderthals and Denisovans, and that the differences may have arisen by chance as the groups evolved. Hawks, too, has been digging into the archaic genomes, and his team has already discovered that Neanderthals and Denisovans lack certain forms of genes that may help modern humans to fend off epidemic diseases, such as measles. This is hardly surprising: the low population density of hunter-gatherers meant that epidemics were unlikely, so they probably would not have benefited from these immune genes. But Hawks's team is now using the find to test whether the defensive genes are linked to autoimmune diseases. In September, Hawks and his colleague Aaron Sams are scheduled to present data at a meeting of the European Society for the Study of Human Evolution in Leipzig, Germany, showing that the Denisovans lacked nearly all of the gene variants linked to coeliac disease, a gut autoimmune disorder present in modern humans. Hawks suspects that the variants may actually be in the same genes that are linked to epidemic resistance — if they are, further study could reveal how recently such autoimmune diseases arose in humans. Unlike most scientists mining the ancient genomes, Hawks has reported some of his more prosaic findings — Denisovans didn't have red hair, for example — on his blog (see go.nature.com/irclra). "These genomes are publicly available. There's nothing stopping high-school students from doing this, and the kind of stuff that I'm putting out on my blog is the stuff that a smart high-school student could do." More significant (and closely guarded) insights will come from developing new methods for analysing ancient genomes to test hypotheses about evolution, he says. Pääbo, Reich and the other scientists involved in sequencing the ancient genomes are eager to see others run with their data, but caution that they need to be aware of the limitations. "They're really terrible-quality genomes", chock-full of gaps and errors and sections in which short stretches of DNA sequence have been put in the wrong place, says Reich. "There are a lot of traps in using these data, and if people are not careful they'll find all sorts of interesting things that are wrong." Pääbo's team is working on improving the quality of the sequences and including data from more Neanderthals and — he hopes — Denisovans. Pääbo says that he and his team regularly receive e-mails from scientists asking them questions about using the ancient genomes, which they have attempted to make as user-friendly as possible. But if the first year of ancient human genomics is any indication, these requests will multiply as scientists find new applications for the genomes. "Maybe we should write a little booklet called archaic genomics for dummies," Pääbo says. If you find something abusive or inappropriate or which does not otherwise comply with our Terms or Community Guidelines, please select the relevant 'Report this comment' link. Comments on this thread are vetted after posting. Whoa. My brother got me a kit for the Genographic Project years back. I had to choose between paternal and maternal ancestry only. This test gives up so much more information.